BONUS! - If you purchase an Osmo, the Osmo company will give a free Osmo to the classroom of your choice! FREE!!! Handheld Digital Microscope - We have one of these in the classroom. Fantastic tool that makes microscope use so easy and fun! Chess!!! - excellent for logical thinking and strategy!! Every household should have a chess set. As I come across more neat learning tools, I’ll send them your way! Don’t forget - Buy one Osmo, and they will donate one to the classroom of your choice - FREE! We have been very busy in GT the past few weeks. With science projects, imovies, appy hour, makerspace, art and engineering challenges - we have been innovating, creating, and learning while having fun! Our days seem to fly by. Please check with your GT student to see if they need science supplies for their experiments. They have their experiment supply list saved on their Google Drive account. We are also ready for the tri-fold science fair display boards to start coming in. You can get the display board at a craft or office supply store. Speaking of prizes - Thank you to all who voted on the 3rd grade Lysol Healthy Habits videos!!! The 3rd graders won 2nd and 3rd place with their work. They will receive $700 for classroom supplies and lots of Lysol products to keep our room clean and healthy! Thank you for supporting their creativity and risk taking. Thank you for all your contributions to our classroom maker space. We can always use more scotch tape, cardstock, and clear plastic number 6. What an exciting week in GT! Did your GT student come home and stump you last week by asking if you knew what a Thaumatrope is? I hope they came home just as excited this week with their Zoetrope. These two items are helping your child learn about language, the arts, life before technology, and perseverance! (I learned quite a bit about perseverance this week too!) Those Zoetropes were a challenge, but we didn’t give up. This year I will really be concentrating on teaching the kids to approach every new topic with the eyes of a scientist. We will question, research, hypothesize, experiment, analyze, and share our findings. The scientific method is a valuable approach to life, not just science! Each week, I will be hosting an Appy Hour during our GT day. During Appy Hour I will introduce your child to a new App or useful computer tool. Next week we will learn about Google Drive, and Google classroom. I am a Google Certified Educator and I’m excited to teach your child about the amazing things Google Drive and Google Classroom have to offer. We will use both of those tools on a regular basis this year, and these tools are used in our district from K to grade 12. Thank you to all the parents that have filled out the social media permission form. If you haven’t done that yet, please visit http://goo.gl/forms/r3eeDFw1JN to let me know if we have permission to post photos or videos of your child. Here is a great example of how we will showcase your child's work and creativity! Is your child interested in Science or the Medical Field? What really happens behind the closed doors of an operating room? What do the masked doctors, nurses and technicians do inside those rooms? Find out when the Seton Healthcare Family presents the 25th Annual Mock Surgery & More event. Mock Surgery & More gives visitors the opportunity to learn what happens during surgical procedures and about many health care professionals and organizations that support surgical care. Self-paced tour takes approximately 2 hours. Tours may begin at any time – no reservations needed. Registration fills up fast, so register today! I can not believe it is already mid December. We have been so engaged in learning that our days are just flying by. This past month the 1st and 2nd graders have been busy learning about and experimenting with the different states of matter, artistically creating, and have plunged head first into the wonderful world of analogies and word riddles. 3rd grade finished up their study on potential and kinetic energy recently. They created some amazing paper roller coasters to apply their knowledge. They are now off in space, exploring our solar system. Each 3rd grader will be presenting a report on a planet of their choice, and creating a travel brochure and sales pitch to try to get us to visit their planet. We will be hosting a Solar System Tournament to finish off our studies. May the best planet win! This week your student might have come home with the Six Flags Read to Succeed reading log. (it was optional for those interested) Simply help your child log any time spent reading for enjoyment. When your child has read for 6 hours total, send the log back to me. I will submit their reading log to Six Flags and they will be awarded a free ticket to the amusement park. I also allowed the students to take a reading log for siblings; the whole family can join in on the reading (and amusement park) fun! This is our last week for the "Kids with a Purpose" campaign. 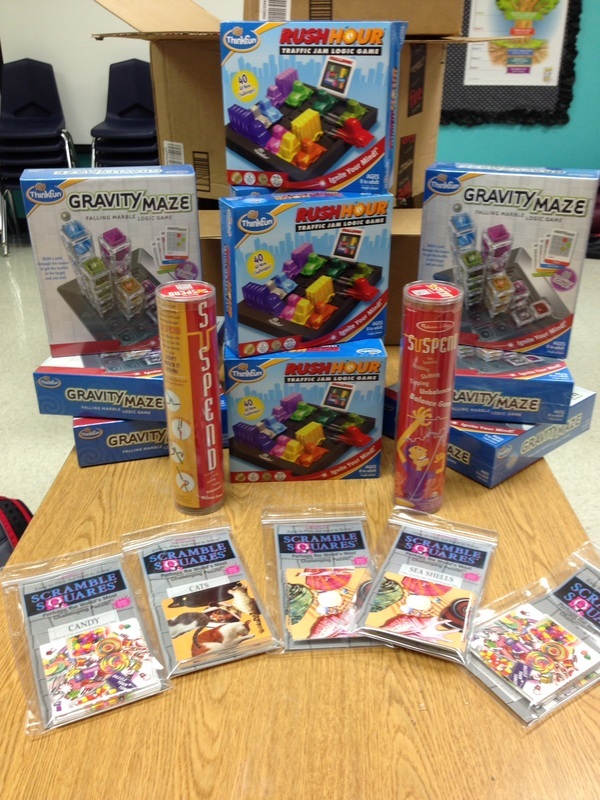 The elementary GT classes on all three campuses have been collecting board games or logic puzzles to donate to needy children. We have received so many donations! Thank you for your support. We are only about 50 games away from our goal. If you are able to donate a game for this cause, please send it to the office with a note that says: "Kids with a Purpose". DSE 1st, 2nd, and 3rd graders, and WSE 1st and 2nd graders have submitted a request for a Dripping Springs Education Foundation Student Leadership Grant. The students worked very hard on finding a meaningful and worthy cause that was important to them. They spent a great deal of time researching, analyzing, and collaborating during the grant writing process. Student speeches were given and elections were held to determine leaders. Ask you student to tell you about the project they came up with and how they are hoping to make a difference in the world! I hope you all enjoy a wonderful holiday break! I can't begin to thank you enough for you generous contributions to our Donors Chose project! 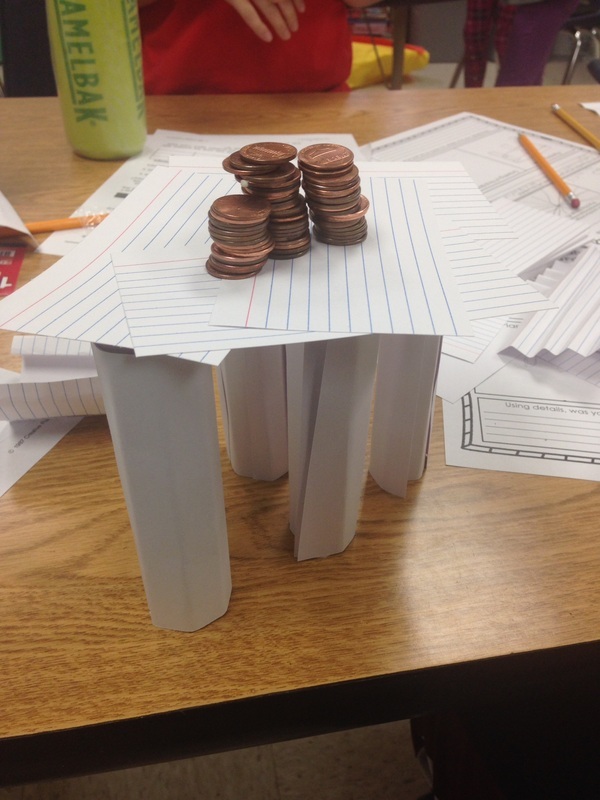 Your donations to our classroom provided us with several exciting new critical thinking activities. Even more exciting - most of the items arrived today!!!! I can't wait for next week so I can share the good news with the kids. Thank you so very much for helping our classroom grow into an even more amazing place! All items will be evenly shared between all three elementary schools. Another great week of learning in GT! We dove deeper into computer science this week. I have been amazed at how quickly the students are learning our new coding skills. They are block coding currently, but are working toward learning java script. We learned what an algorithm is this week as well! 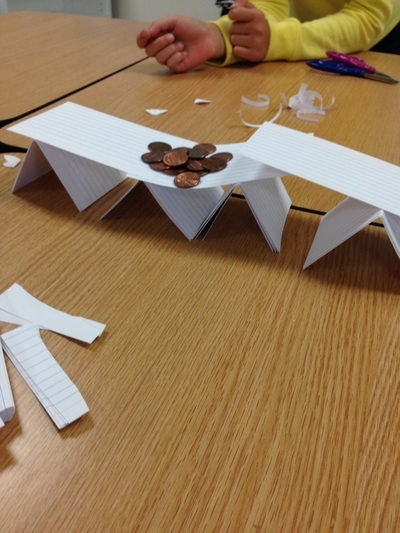 First and second graders worked on bridge design and engineering. 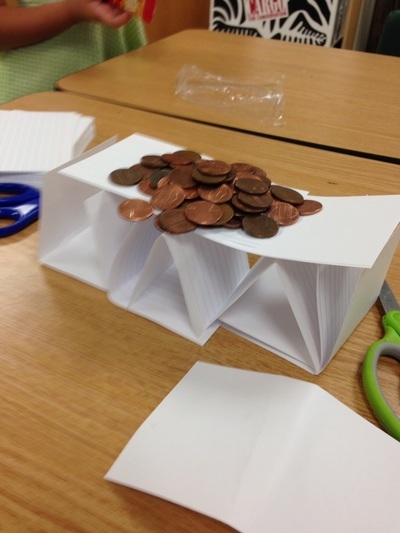 They were faced with the task of creating a bridge that was the tallest and held the most weight. The tricky part was they could only use index cards and scissors. I was quite impressed with their ingenuity and perseverance. 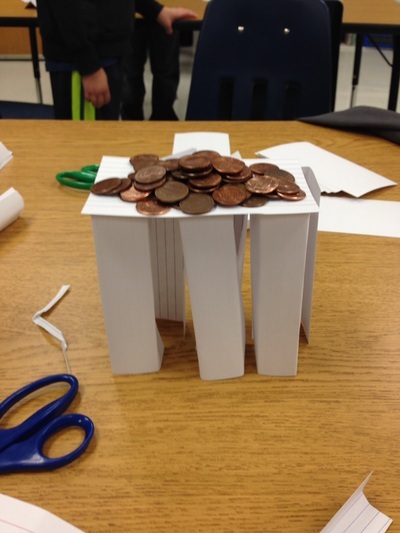 The students not only learned about structure and design, they honed their collaboration skills while working as a team. The DSES third graders are working on their roller coaster creations to demonstrate their understanding of potential and kinetic energy. They are not only designing, constructing, and collaborating on this project, they are also having to keep track of the cost of the roller coaster materials as they "shop". 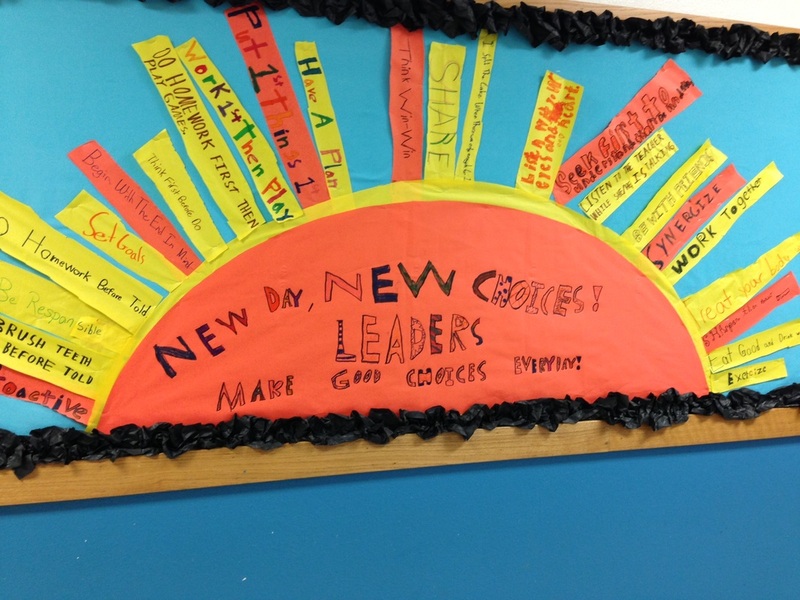 The third graders also created an amazing leadership bulletin board outside our classroom. We have received many compliments on their creative contribution to our school. In October, the 1st and 2nd grade GT students were given a creativity challenge. They were to take an empty box and transform it into... Not a Box. Our inspiration came from two books by Antoinette Portis; It's Not a Stick & It's Not a Box. You won't believe how creative the boxes are! Energy! That's what it's all about! This week the 3rd graders learned more about energy. Last week we explored Newton's 1st and 2nd law of physics. We discussed inertia and made marshmallow shooters to experiment with unbalanced force. This week we dove in a little farther and explored potential and kinetic energy. The students created potential and kinetic energy machines. (aka toilet paper roll slingshots) We also used our knowledge of physics and energy to create some online roller coasters. The game can be found on my "Fun Links for Kids" page on my website. The GT students have also entered the wonderful world of online blogging. 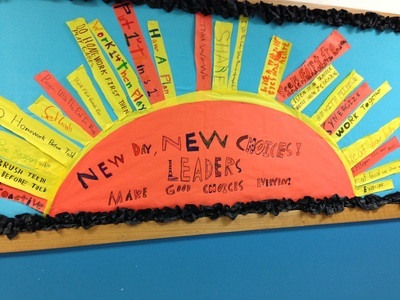 We have created a class blog! The blog is private and only accessible by invitation. Parents, if you are interested in being a guest blogger just send me an email. I will happily invite you to join us! Our blog will be used to collaborate, discuss new ideas, share the fun things going on in our room, and to practice writing skills. We will continue our Computer Science lessons over the next several weeks. During these lessons we are learning to code (program). The kids love it, and are having so much fun they don't even realize they are learning! Looking forward to another great week in GT! Follow us for updates on our class activities.